Gallows Pole was formed (unofficially) back in 1977 in Vienna, Austria. In 1979 the band released their first single Shut up/Destiny under the name Angelina. It was number one in the Austrian charts. 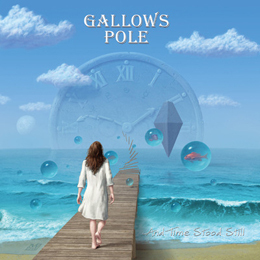 Then the band decided to change the name, and Gallows Pole was officially born. And since then the band have been playing melodic rock music and of course recording it. And now this very old school band is back for more. On this album you will find all the typical trademarks of the band: melodic hard rock that could very well be an old movie soundtrack. And I have to admit that it does have some charm, but the lyrics are so lame that its just to much work to try and listen to this hole record. But I have to say these chaps do know how to make music that still sounds interesting (except the lyrics) after all those years.